Its 1910. Poesy Swift has been travelling for nearly a year with the Percival Lilliputian Opera Company. But it hasn’t all been plain sailing. After arriving in India the company was in trouble right from the shore and Mr Arthur Percival hasn’t been the most respectful man. One terrible disataer after another and with money running short tempers get hot and the children are caught up in problems they never thought they would encounter. What can Poesy and the other boys and girls do to protect themselves and who will get hurt along the way? India Dark is based on a real life story that Kirsty came across years ago. She was offered an essay from an Australian theatre historian and was told that a childrens story hhad to be written about the events. This is quite possibly the reason why I was so enamoured with the story that ran through India Dark and why I just had to keep turning the page even though tea was burning and there was presents to open this Christmas! The story was fascinating. It starts with Poesy running out of the courtroom in 1910 and then goes back nearly a year to Poesy meeting tilly and getting her place within the Company. I love it when you get a snippet of the future story like that in books and with India Dark it made me want to read as fast as I could so I knew how thechildren ended up in the courtroom in the first place! The story was deeply sad and moving in places, it was a story of loss of innocence, of being an Australian child in the early 1900’s, of friendship and of loneliness. It was a moving story about a group of children thrust into an adults lifestyle and what can happen in that sort of environment. I don’t want to say too much because I really don’t want to give much of the story away but it was brilliant! The front of mycopy of the book, an ARC, had a “cast” list, with the names of characters, their ages and in what I believe to be, order of importance to the story. This really helped because there were many characters mentioned and with similar names, for the first 100 pages or so I was flipping back and forth trying to remember who was who but I soon worked it out thanks to that list! I loved the way it was designed the way a theatre programme would be too, that was a great touch. The main characters were Poesy and Till, the story was told from their alternating points of view, but not chapter by chapter like many books are told… sometimes it was two chapters from tilly then one from Poesy and back to Tilly… but other times it was a few from one of the girls then a few from the other. I really didnt find this confusing at all because the chapters had their headings then the name of which girls perspective it was. However after a while I stopped reading them because the voices were that much different I could tell which girl it was meant to be! They were both brilliant characters but for very different reasons. It was fascinating to get both their perspectives as Poesy was still so innocence whereas Tilly was obviously quite in touch with the world around her and thought herself very grown up. I did find Tilly a bit bossy and a bit in love with herself but I understand completely why she did the things she did… more so than why Poesy did the things she did! The other characters were brilliant written too and had such a presence on the page that I could picture them perfectly. Mr Arthur was the right amount of evil yet charm, and Eliza was the perfect hot headed 18 year old who believe everything she thought was right. Charlie was by far my favourite character and his magic tricks never failed to put a smile on my face. India Dark really gives a mixed sense of emotions… its sad, with some characters dying and horrible things happening to others, yet with beautiful, happy events too. It was so well written that you can be nearly crying on one page and trying not to laugh out loud on the next. I really love the theatre background to this book and even thought I’m a relative newcomer to historical fiction, Kirsty Murray is another author who makes me want to go and read up on this passage in time and geek up on the events! 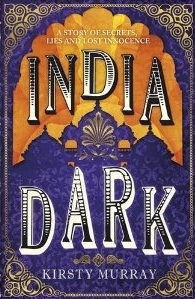 I really recommend India Dark to any historical fiction or theatre nut you know! India Dark is the most recent in a list of historical YA from Kirsty Murray and will be released on January 1st from Templar. My copy was received in exchange for an honest review… please come back on January 13th for my stop on the India Dark blog tour. I have my stop on the blog tour on the 11th, and my review is going up the same day so I haven’t actually got around to it yet, but I’m so excited now! This sounds like a really interesting read. I’m always a little dubious of books that provide cast lists so I think I could easily have not bothered with this one.